Sunday, December 22 1907 -- Although not an 'official' Mr. Proones episode, and thus not included in the By George book, a fellow who looks suspiciously like him (in the black suit) makes a guest appearance in this delightful sports page strip. If Terr'ble Thompson reminds you a little of another more famous T.T., the animated cartoon Tom Terrific, there's good reason. Both are the brainchildren of Gene Deitch. Deitch is better known for the cartoon since Terr'ble Thompson ran just six months, from October 17 1955 to April 15 1956, in a handful of newspapers. The daily and Sunday strip was distributed by United Feature Syndicate. The strip had a lot going for it. Great art, cute fantasy stories -- it had the qualities necessary for a strip that would really catch on. But Deitch was burning the candle at both ends, producing the strip at night after running the UPA animation studio during the day. When CBS Television bought the Terrytoons animation studio and asked Deitch to run it, a hard decision had to be made. Reluctantly, Deitch gave up his newspaper dreams in exchange for an important position in the new world of television animation. 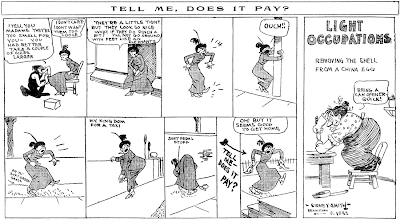 Unlike most obscure strips, Terr'ble Thompson has always had a fan following because of its connection with the beloved Tom Terrific cartoons. In 2006 Fantagraphics issued a complete reprinting of the strip, a recommended book for your comic strip library. The great Sidney Smith's main claim to fame is his long running soaper-adventure-humor strip The Gumps. But he has quite a few other credits, including this obscure comic strip that he produced in 1916. I assume it was produced for the Chicago Tribune, but when I indexed that paper many moons ago when I was still an unschooled researcher I failed to notice it. Perhaps back then I saw the lack of a consistent title and didn't consider it a series. So anyway (hint, hint) if anyone has access to the Trib on Proquest a report on running dates would be much appreciated.Or maybe I'm completely off-base and Smith moonlighted with a different syndicate for this one. It did run in the Minneapolis Journal, for instance, which took all the rest of their line-up from Press Publishing/New York World. 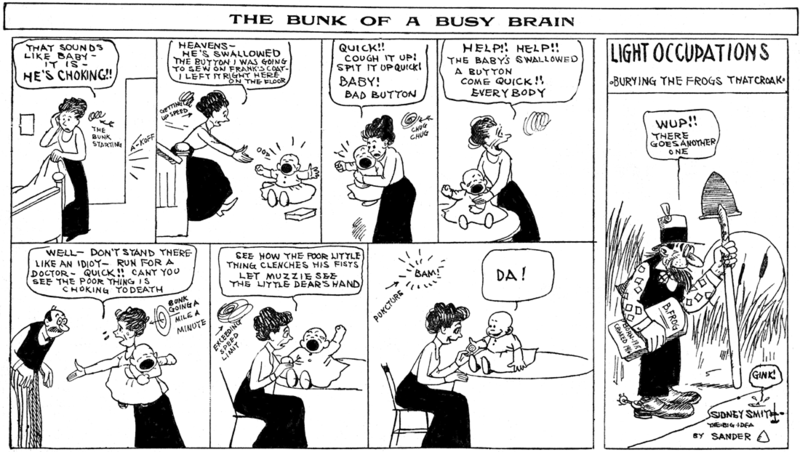 Smith modeled this feature after others of the day that used revolving or inconsistent titles, like the features of Rube Goldberg and Clare Briggs. Among Smith's line-up of recurring titles were The Bunk of a Busy Brain, It Depends on the Point of View, Tell Me Does It Pay? and Wasted Energy. As you can see above, other one-shot titles were used as well. 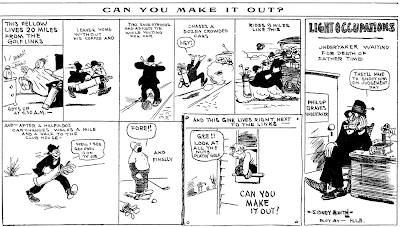 The one consistent title to the feature was for the panel cartoon portion called Light Occupations. Some papers actually ran this panel as a separate feature (the Cleveland Leader for one). Smith's untitled 1916 effort was a really wonderful feature. The lack of a consistent plot or set of characters really gave him room to spread his comedic wings. Sometimes witty, sometimes goofy, but always pretty darn funny. Almost makes me wish he had stuck with this rather than creating The Gumps. Hello, Allan--The Sidney Smith strip started as a local sports- oriented feature in the Chicago Tribune on Oct. 28, 1914. It initially appeared in various odd sizes before adopting the aspect in your examples, most likely to make it more easy to syndicate. "Light Occupations" ("No. 1") appears in the first episode. It lasted until Saturday,Jan. 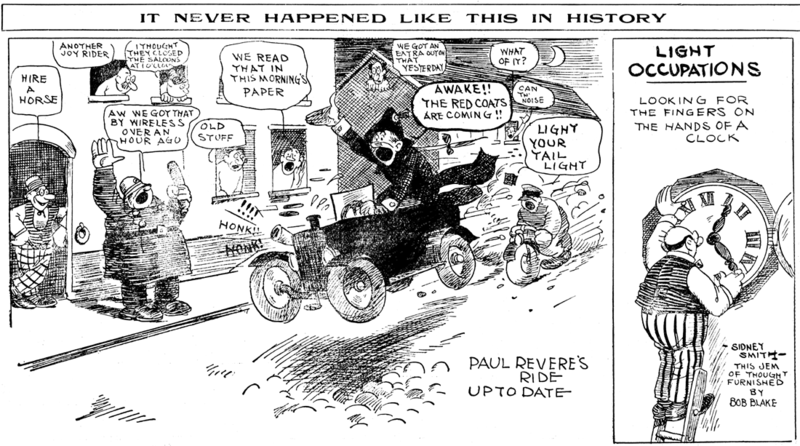 20, 1917, and the following Monday saw the daily version of Smith's OLD DOC YAK. ----Cole Johnson. Thanks for confirming that this was indeed a ChiTrib feature. I do seem to recall Smith's sports cartoons in the Trib, was there a specific date in which he switched in the direction of straight humor, or at least sports humor as opposed to sports editorials? The feature only seems to have been syndicated in 1916, and by then there's no sports content. First of all, my apologies for falling down on the job again and letting the blog lie fallow for a week. I can only plead that my personal life would make even Mary Worth lose her cool. Let's turn the lights back on, though, and talk about Dinky Fellas. Morrie Turner, a black cartoonist who gained some modest success as a freelancer in the 1950s and early 60s, turned to newspaper cartooning in earnest in 1964. He created four different features in quick succession, the most notable of which is Dinky Fellas. The idea behind the strip was to have children of different races interacting as equals, a concept whose time was ripe in the years of the civil rights movement. The strip was initially sold to the Berkeley (Ca.) Post and the Chicago Defender, both black papers. The strip began appearing five days a week in the Defender on July 25 1964, but may have run in the Post a little earlier (anyone know?). Unsatisfied with 'preaching to the choir', Turner wanted to have the strip running in mainstream 'white' papers as well. He reworked the strip, adding new characters of more races and faiths, and with the help of impresario Lew Little, marketed the tweaked strip as Wee Pals. Little, a salesman of the highest caliber, convinced mainstream newspaper editors that the time had come for a multi-racial strip that preached equality and racial harmony. Dinky Fellas was discontinued in favor of the new strip on December 18 1965 after Wee Pals had been running for ten months. In 1967 Wee Pals was picked up by the Register and Tribune Syndicate and became a staple of as many as a hundred newspapers. The strip was eventually even adapted into a Saturday morning cartoon series, Kid Power, a favorite of yours truly as a young rugrat. Turner has received many well-deserved accolades for his soft-pedaled message of peace between races in Wee Pals, which continues today from Creators Syndicate. Now in his late-80s, Turner no longer signs the strip but his message is still there loud and clear. A biography of Turner for juvenile readers written by Mary Kentra Ericsson was published in 1986 by Childrens Press. Although sadly light on the facts of Turner's work for the Chicago Defender, Turner's inspirational story is otherwise well told in Morrie Turner Creator of Wee Pals and is recommended reading.